Laurie Weeks, Zipper Mouth. New York: Feminist Press, 2011. Fiction. 144 pages. ISBN: 978-1-55861-755-3. 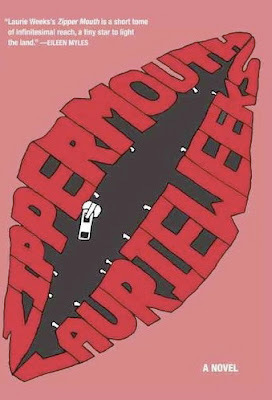 Laurie Weeks' Zipper Mouth is the story of a girl living in New York. New York is populated by jobs she hates as well as parties that facilitate ecstatic transformation, but the scenery is dwarfed by her unbearable, thunderous desire. This girl, without apprehension, is accessed by her desire on every level she has ever operated - as a child falling wordlessly for celebrities, as a teenager aching to establish a dialogue with Sylvia Plath - and Weeks conducts this chorus with a kind of mastery that is endlessly positive for young girls to see. Her story demonstrates how it is alright and it is beautiful for girls to want hard - for a better job, for love, for recognition, for things they cannot verbalize. While Weeks does come off through her intimate storytelling as the kind of writer young readers will be dying to talk to once this book finds its way to them, a passionate reading and re-reading of this book will serve to reassert that Weeks does everything right, provides all the words about desire for girls who do or did not have them. With this novel, Weeks has nailed it. Any young girl who reads Zipper Mouth will be armed with the reassurance and sense of belonging in her own desires that stories unconcerned with the scope and power of her own person fail to provide her. It is books of such indifference that make up the majority of what girls are prone to reading, and for the sake of teenagers, Zipper Mouth deserves the ubiquity of a series like Gossip Girl. Recommended for collections of contemporary fiction, small press fiction, New York fiction, feminist fiction, women writing fiction, and queer fiction.